U is not your average free messenger. Experience a new way to connect with friends through photos, text, Audio Photos and stickers, turning spontaneous moments into instant social communications. U gives you full control over your content, letting you recall messages and photos even long after you’ve sent them. U is also fully integrated into CyberLink’s multimedia ecosystem, the world’s most complete set of consumer digital media solutions. Bring your photo moments together in group photo chats, whether its photos from traveling, dishes you’ve eaten or beautiful moments you’ve enjoyed. Select friends to share with and let them contribute their own photos, creating a space for everyone to comment on and chat about the photo moments. Share the snapshots of your life with only those you choose, sharing work photos with colleagues, family photos with relatives, and weekend outings with your friends. 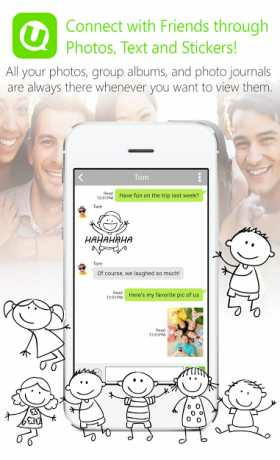 – Chat with friends and express yourself using text, photos, voice messages, Audio Photos, and animated stickers. Form group chats with as many members as you want because with U, there are no limits. – Make and receive free voice calls to any of your U contacts. If you’re busy and can’t answer a call, just send a personalized U message to let the caller know with a tap of your screen. 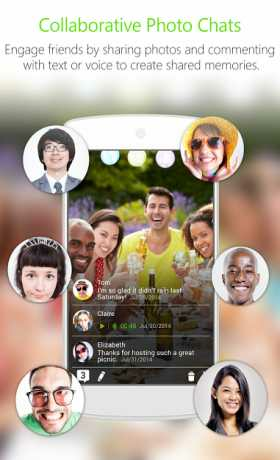 Gather photos from all of your friends in one group album to view life’s best moments from all angles. Add voice or text to your photos to share your moments and preserve your memories forever. Keep the conversations going long after you capture photos from outings with friends, dinners with family and traveling! – Create forums and send instant bulletins to large groups, perfect for clubs and workplaces. 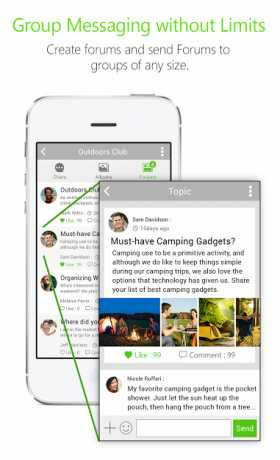 – Add Polls to your Group Chats to easily collect opinions from members, create surveys or simply organize a group lunch all with U Messenger. Remember all the details of your best photo moments by adding text or voice notes that become part of your albums forever. Recall text & voice messages, stickers and photos, removing your sent content from your friend’s device even after it has been read. Delete your full history with a friend by choosing to Break Up or take back all content including messages and photos, removing it from their device and deleting the friend from your friends list and theirs. Self-Destruct messages that are private or sensitive. Set the timer for text & voice messages, photos, or stickers to disappear in as little as 3 seconds or as long as 7 days. Never forget birthdays or other important moments with your personal assistant Delay Send. Schedule text & voice messages, photos, or stickers to be sent at a specified time and date in the future. Voice Messaging allows you to communicate with a friend or group quickly by sending a voice recording instantly. Audio Photos give your images a voice to tell the stories, comments and context behind the shot. Now add voice or text to your photos to share your moments and preserve your memories.